Notice: These models of our wire trackers, NF-8601W,NF-8601S,NF-858C and NF-388B, are available in Russian Warehouse. From now on, the orders shipping to addresses within Russia, will be dispatched directly from local warehous and buyers should get the parcel around 7 business days. Note: Since the international air does not allow the hair contains flammable and explosive goods, so the unity does not contain the battery delivery, thank you for understanding! 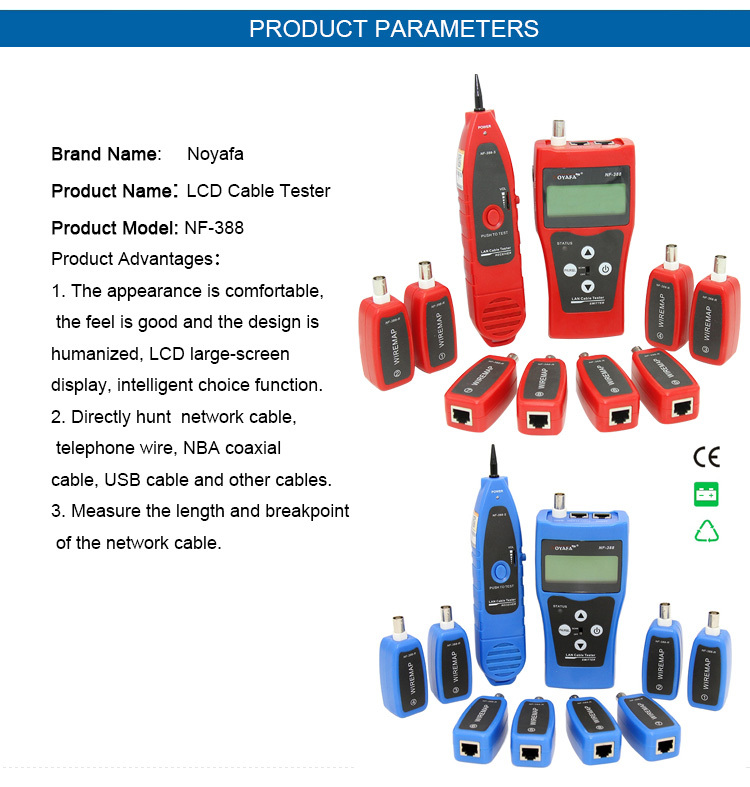 NF-388 multipurpose network cable test & inspection instrument is the latest cable test & inspection instrument with lots of new functions researched and developed by our company. 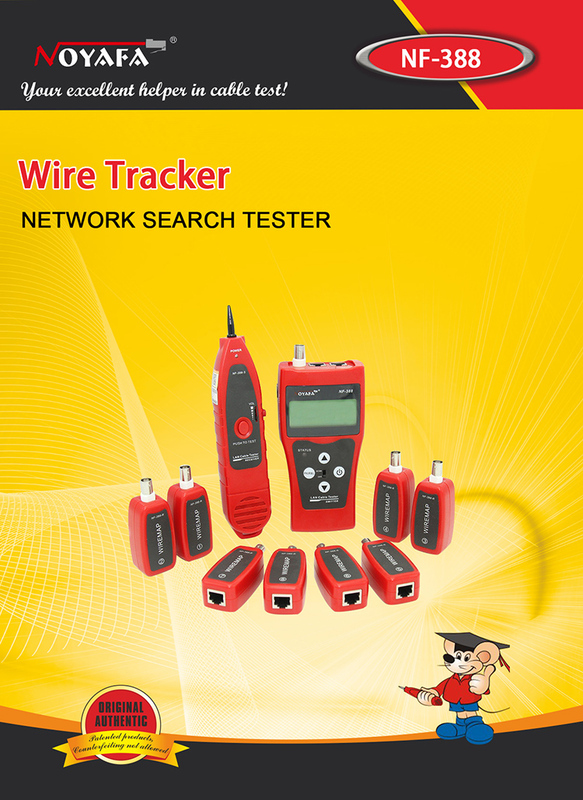 The equipment is composed of tester (NF-388), receiver and remote identifier. The new instrument is provided with fluent appearance, excellent hand feel and considerate human-centered design. 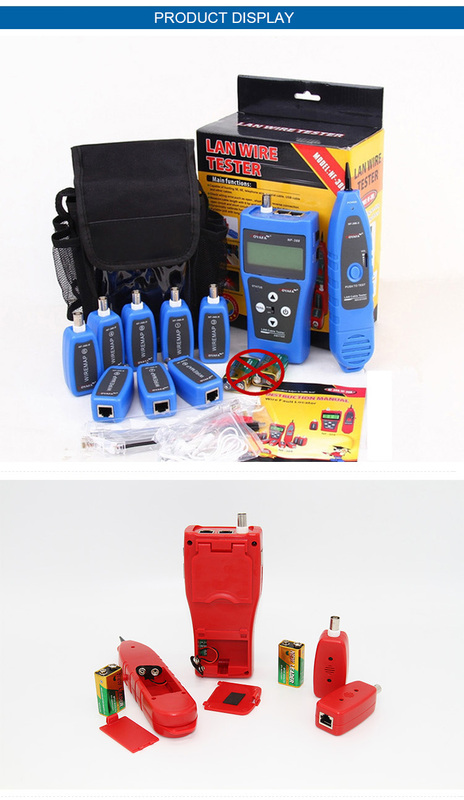 It owns three great functions of hunting,wire sorting and circuit status testing and the features of quickness and accuracy, thus, it becomes available tool for technicians in installation and maintenance of weak current system, such as, communication line, comprehensive wiring circuit, etc. 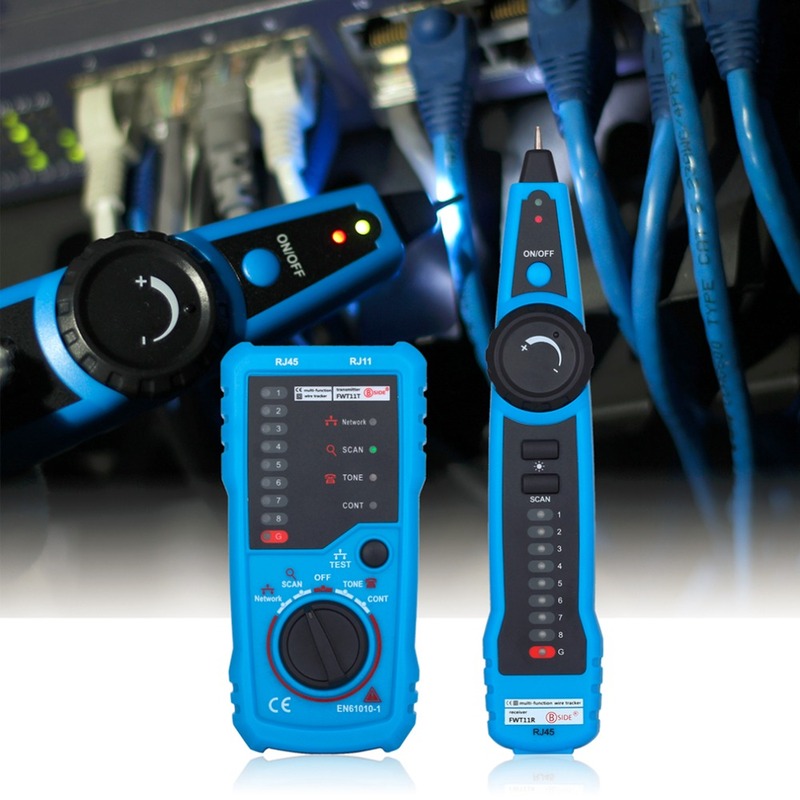 It is widely applicable to telephone system, computer network, other metal wire circuit and other fields. 1.One person enough to complete cable continuity check. 2.Directly hunt 5E, 6E, telephone wire, coaxial cable, USB cable and other cables. 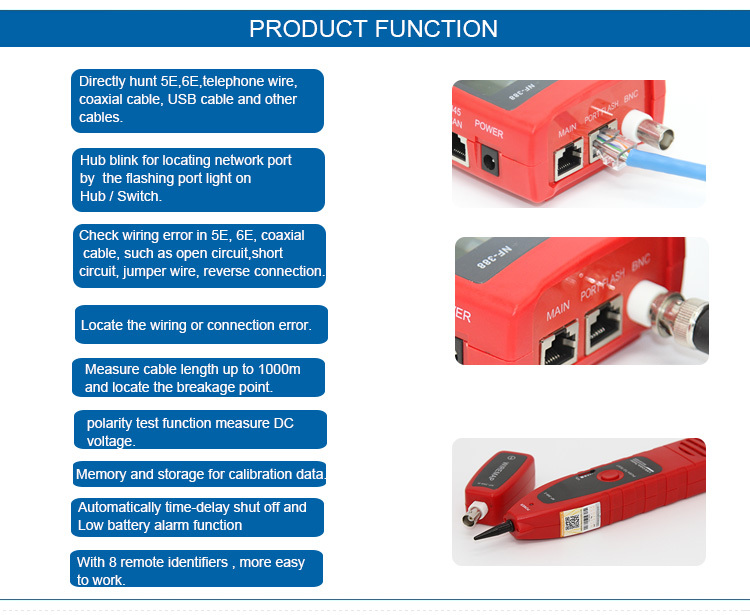 3.Check wiring error in 5E, 6E, telephone line, coaxial cable, USB cable and such as open circuit, short circuit, jumper wire, reverse connection or cross-talk interference. 4.Locate the wiring or connection error. 5.Measure cable length and determine the distance of open circuit and short circuit. 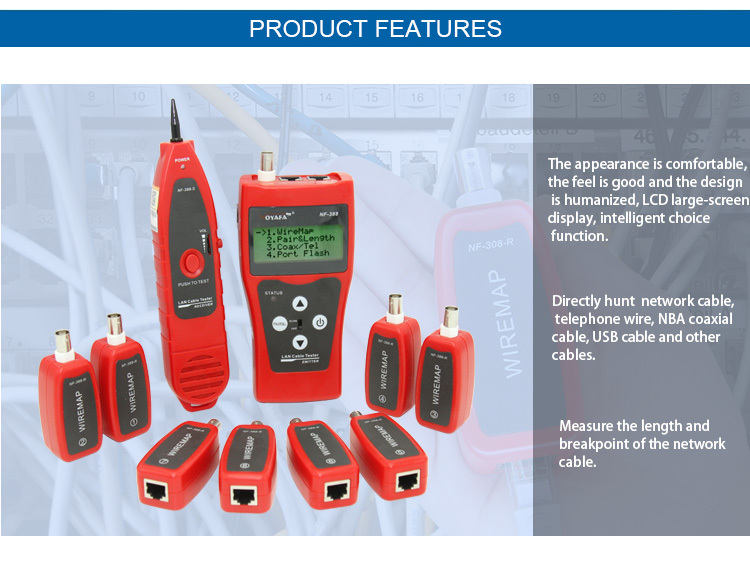 6.Dynamically calibrate cable length and make length measurement as accurate as 97%. 7.Simple and easy use. Big screen to display test result clear. 8.Portable unit with long battery life (wait-case 50 hours). 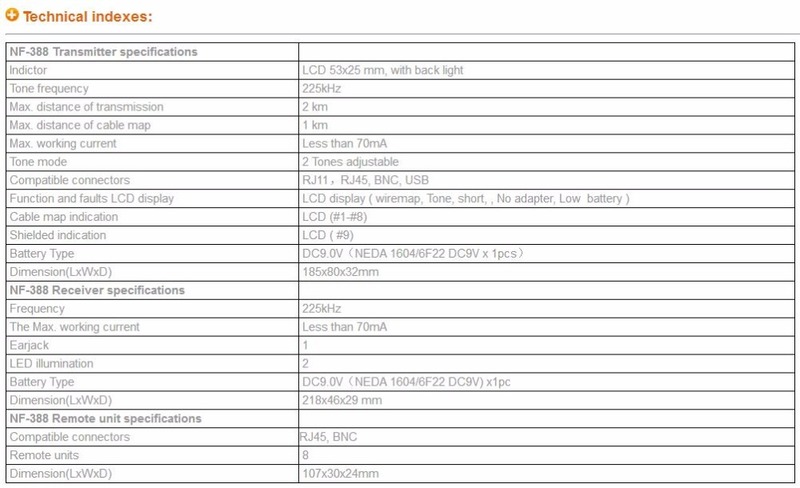 9.Automatically time-delay shut off and backlight display function. 10.Measure length and pair with or without far-end recognizer. 11.Locate cable and there are 8 far-end passive test jacks (ID No.ID1-ID 8). 12.Far-end recognizer with prompting voice. 13.Self-checking function and automatically compensate any change in battery capacity or ambient temperature. 14.Single board computer software watchdog design and reliable operation. 1. Directly hunt 5E, 6E, telephone wire, coaxial cable, USB cable and other cables. 2. Hub blink for locating network port by the flashing port light on Hub / Switch. 3. Check wiring error in 5E, 6E, coaxial cable, such as open circuit,short circuit, jumper wire, reverse connection. 4. Locate the wiring or connection error. 5. 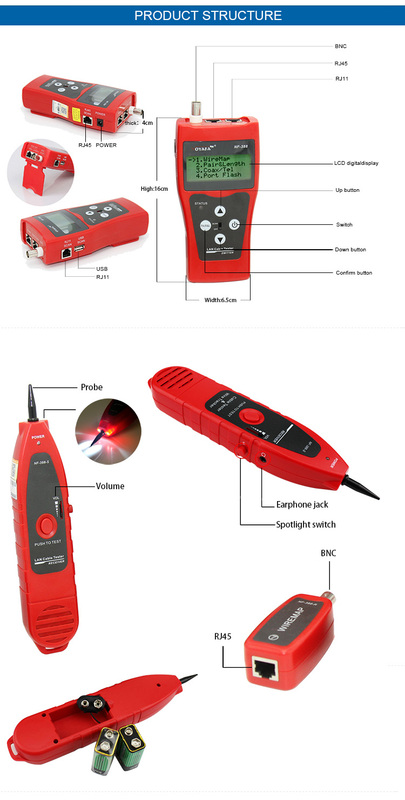 Measure cable length up to 1000m and locate the breakage point. 6. polarity test function measure DC voltage. 7. Memory and storage for calibration data. 8. Automatically time-delay shut off and Low battery alarm function. 9. With 8 remote identifiers , more easy to work. 1.Don\'t connect high voltage live lines to avoid buring out the machine. 2.Put into the right place to avoid hurting others,because of the sharp part. 3.Connected the cable to the right port. 4.Read the user manual before use it. 1. We accept Escrow. You can Pay via Alipay, Visa, MasterCard, Western Union, Qiwi and bank transfer on AliExpress. 2. Please make the payment as soon as posible so that you can get the item earlier. 3. Note: Any import tariff of the item is the buyer\'s responsibility, not included in the selling price or shipping fees; But we will declare the product as a gift with a lower value to help you easily get the item through the Customs. 1. WORLDWIDE SHIPPING (except a few countries and APO/FPO). 2. All the orders will be promptly processed and most orders can be shipped out in 2 days after the payment is confirmed. 3. Owing to stockout and holidays, some orders may need a few more days to be shipped out than usually. Please be patient! 4. We only ship the item to the confirmed order addresses, so please make sure that your order address matches your delivery address. 5. Optional shipping ways: AliExpress Standard Shipping,China Post Air Mail, HongKong Post Air Mail, ePacket, EMS, DHL, etc. 5. Almost all the orders under 2kg is for free shipping by China Post Air Mail. Please choose other shipping ways if you need the item urgently! 6. You can track the parcel with the tracking number on the website: 17track.net/en/result/post.shtml? 1. You can contact us and then send the item back to us within 7 days after the item is delivered. If the item is in your possession more than 7 days we will considerit used and won\'t offer you a refund or Replacement. 2. All the returned items must be in the original packaging. Beside, you must provide us a shipping tracking number and the specific return reason. 3. We will offer you a refund or resend you a replacement according to the specific condition and your will after you return the item. 4. We will bear all the shipping fees if the product is broken or not as described on the product page link. 1. Our goal is to ensure that all the buyers are satisfied with our product and service. 2. We sincerely hope you can leave us a perfect 5 star positive feedback if you like the item. 3. Please contact us before you will open a dispute or leave us a negative feedback, and then we will give you the best solution. 1. Welcome to our store! Please don\'t hesitate to contact us by TradeManager or E-mail if you have any questions about our product and service! 2. Your messages will be answered right now and emails will be replied in 2 working days. Please kindly resend the messages or emails if you don\'t receive our reply! 3. Our working hours: 9:00-18:00 (GMT+8) of Monday to Saturday.